Are you tired of reading pages of technical information only to end up more confused than before you began? 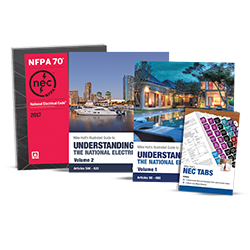 · Easy-to-read explanations of the NEC written by renowned author and electrical expert Mike Holt. · Vibrant, full-color graphics that give you a detailed illustration of the Code articles. · Cover-to-cover challenge questions that provide a review of the information you are learning and verify that you are really “getting it”. · Our top selling Codebook Tabs that include the index to help familiarize you with the most important Code articles and train you to quickly navigate your Codebook in the field or for you upcoming exam. Whether you are just starting in the field or veteran of 20 years, this package is a must for anyone working in the electrical industry.